Apr 20, 2019 at 07:30a.m. - Apr 20, 2019 at 06:15p.m. 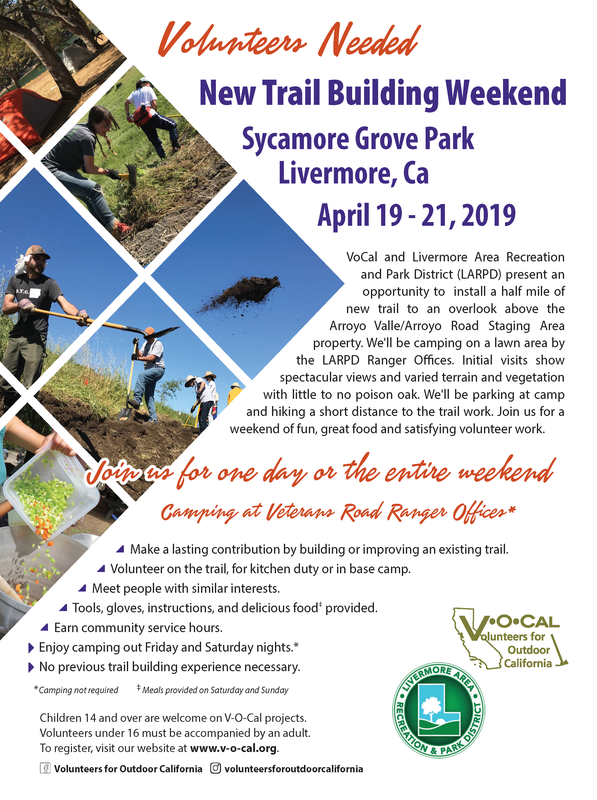 Livermore Area Recreation and Park District (LARPD) and Volunteers for Outdoor California (VoCal) present an opportunity to install a half mile of new trail to an overlook above the Arroyo Valle/Arroyo Road Staging Area property. We'll be camping on a lawn area by the LARPD Ranger Offices. Initial visits show spectacular views and varied terrain and vegetation with little to no poison oak. We'll be parking at camp and hiking a short distance to the trail work. Join us for a weekend of fun, great food and satisfying volunteer work.